TH Seeds sells cannabis seeds and the company has been around since 1993. That makes TH Seeds on of the oldest seed banks from the Netherlands. They deliver only feminized cannabis seeds and this brand is very popular among the growers who are consciously working with good quality. The feminized cannabis seeds from TH Seeds are stable and have very good genetics. Burmese Kush from THSeeds are cannabis seeds that are suitable for an indoor and outdoor grow and an ideal strain for the starting grower. In a short period of time she delivers a delicious citrus flavored weed. Kushage from THSeeds are feminised cannabis seeds that have won a reward. These cannabis seeds are suitable for an indoor and outdoor grow. The effect of smoking this cannabis strain is an intense clear high. MK Ultra Wreck from THSeeds are feminised cannabis seeds which are suitable for an indoor and outdoor grow and they are the ideal choice for the starting grower. The taste of this cannabis reminds you of menthol. SAGE from THSeeds are feminised cannabis seeds that contain predominant Sativa genetics. She is mainly suitable for an indoor grow and becomes a robust cannabis plant. The effect of smoking this cannabis is a high which makes you happy. Sage n Sour from THSeeds are cannabis seeds which are suitable for an indoor and outdoor grow. This cannabis strain contains mainly Sativa genetics and she has a powerful high effect. You could grow this strain as Medical Marijuana. Wreckage from THSeeds are feminised cannabis seeds that are appropriate for an indoor and outdoor grow. This cannabis strain has an intense high effect which makes you passive. This cannabis plant is regularly grown because of her medical properties. Het merk T.H. Seeds is een zaadbank die behoord tot een van de oudste van Nederland. Ze verpakken hun feminisd wietzaden in pakjes van 5 en 10 zaden. Het is ook mogelijk deze zaden los (per stuk) bij ons te bestellen, we verpakken deze zaden dan handmatig in vochtvrije 'microfuge tubes' met duidelijke labels. 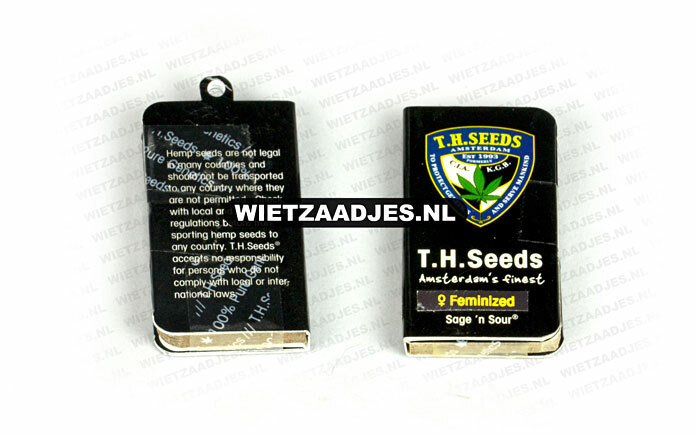 De verpakking van TH Seeds kan verschillen wanneer je kiest voor een ander aantal of andere soort dan dat op de afbeelding staat.